View Customer Feedback | Have Your Say!- Take a poll! LMR 600 series. 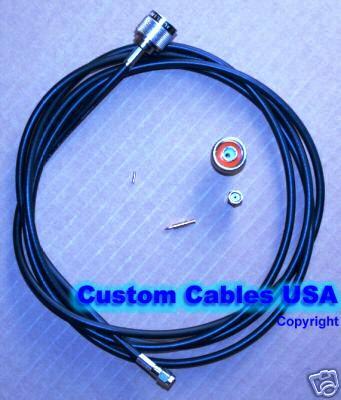 We make custom RF/Radio/Microwave/W/LAN cables! FAST, Easy to work with, and Lowest Discount Prices! See what OTHER customers SAY about us .. Sample products that we sell on eBay ..
Length-matching for pairs or sets of cables are NOT included in these prices listed. We will provide length-matched sets of cables at an additional LOW service fee (depending upon length). Contact Us for such services (precision: upon request). We make Custom WiFi Wireless LAN RF Coax Cables / Pigtails / Jumpers for your special needs! THIRD : Select the connectors you need. Coax Connectors/Adapters: See Pictures or	Find WLAN connector types for devices..
A regular FEMALE connector has threads on the outside and a female receptacle in the center. For cables over 12 ft and below 50 ft, may we suggest that you use the ultra-low-loss LMR400 series cable. Other coax cables, connectors/adapters, etc. -please Contact Us. Connectors ONLY *All RG-58 series are LMR195 equivalent, and 400-series are LMR400 equivalent. No cables included. Current available connectors are mostly 3-piece-Crimp or Solder type only - See Pictures; Contact Us if you need other types. Volume Discounts available. Discount Adapters and Short Pigtail Cables See Pictures; Contact Us if you need other types. Contact Us for volume sales, or special / custom orders. Includes a custom cable of up to 48 in. (or even 5 ft if requestd), and EVERYTHING you'd need to build you own directional cantenna! Discount, Radio pigtails, RF cables, WiFi adapter, WiFi cable, RF jumpers, coaxial jumpers, coaxial pigtails, custom cables, Times Microwave, LMR, RG cable jumpers, LAN adapters, WAN adapters, wireless antenna extension cables, for WiFi router access points or wireless bridges, GPS patch cable, PC PCI extension ... RG coax, RG58, LAN Thin Net coaxial RG 58/U, RG8, RG8X, RG8/X, RG 142, RG 400, RG213 RG214, Cat 5, 142,400, 213,214, 9913, 174, 316 ...coaxial cables; Impedance 50 ohms, Foamed Polyethylene, bonded Aluminum Foil, Tinned Copper Braid, solid center conductor, stranded core, copper conductor, Flame-retardant, UV rated PVC, UV rated Polyethylene Jacket... LMR WBC CA Belden 100, 100A, 195, 200, 240, 400, 600, 900... LMR195 plenum rated, 400 series ultra flex, 400 ultraflex UF, RG142 RG400 high temperature Teflon, temp 200 degrees, equivalent, coaxial adapters, connectors, pigtails, jumpers, custom made cables jumpers pigtails... Length matching service, length matched sets of cables... connector ends: N type male, N female, TNC male TNC female, SMA male female, RPTNC RP-TNC plug jack, RPSMA RP-SMA plug jack, RP-N type plug jack, BNC FME male female, UHF male female Mini-UHF, PL 259 PL259, SO 239, RJ45, 3.5 mm, U.FL Hirose UFL for Mini-PCI card, custom adapters connectors, Gold Plated, Nickel plated, Teflon insulation, crimp, solder, flange, bulkhead (BH), chassis mount, O-ring, right-angle (RA)... connecters, adaptors, N male to N male barrel adaptor, N female to N female barrel adapter, right angle adaptor, pigtail adapters ... cantenna kit, antenna kit, installation support, other wireless WiFi support, signal gain signal loss, low db loss, GHz, attenuation... radio device jumper assembly cross references available. 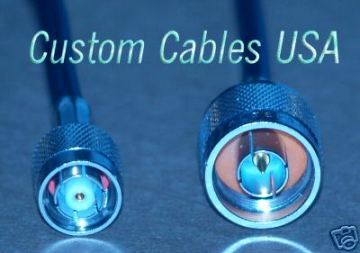 Home | Policy | Contact Us | Copyright © Custom Cables USA LLC customcablesUSA.com, universalweb.com All rights reserved.